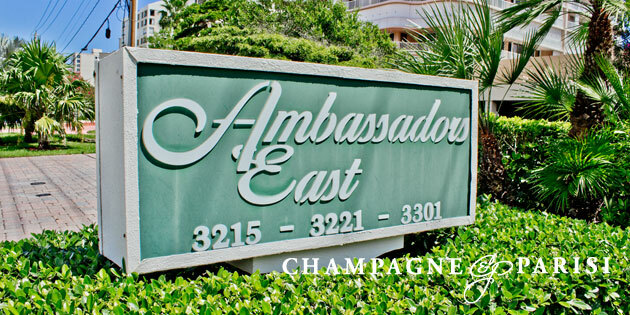 Ambassadors East Condominiums are the definition of resort-style living in Highland Beach, Florida. These three waterfront buildings are situated in the sand along the Highland Beach Coast and overlook the beautiful, blue Atlantic Ocean. The luxury condo buildings provide upscale amenities to all of their residents. Among these services are its top notch fitness center, glorious swimming pools, social rooms fit for various gatherings, a barbecue area, and card rooms. Ambassadors East also features a sauna, billiards room, library, and club house. There is plenty for everyone who lives at Ambassadors East to enjoy. The 2 bedroom, 2 bathroom units at Ambassadors East are just over 1,000 square feet of luxurious space. Every unit is equipped with various upgrades such as marble, hardwood, or tile flooring, spacious kitchen areas with granite counter-tops, stainless steel appliances, crown molding, hurricane impact resistant glass windows, open balconies, and split floor plans. All Ambassadors East Condos also include underground parking, gated security, cable access, trash removal, and if you’re a boat owner there is dock space just across the street! Included below are condos in Ambassadors East, a community of Highland Beach, FL, located in Palm Beach County. These listings are updated daily from the RMLS. If you would like more information on any of these Ambassadors East Condos for Sale, just click the "Request More Information" button when viewing the details of that listing and click the "Schedule a Showing" button to set up a time to view any of the Ambassadors East Condo listings you are interested in. We can provide you with disclosures, past sales history, dates and prices of properties recently sold nearby, and more.